Progressive Insurance likes to flaunt its “Name Your Price” marketing tool to pull in new business. You can tweak your coverage options if you wish, and the prices will change in turn. But, in reality, Progressive and its competitors hold all the cards because they’re the ones setting the rates in the first place. “Name Your Price” is more about choosing between the best options they already offer. It’s not a bad idea, but are you really naming your price? The harsh reality is, your consumer freedom is mostly an illusion (it usually is… and we could say the same thing about cryptocurrencies, with yesterday’s mini-bitcoin crash illustrating the point nicely). In contrast, by selling put options on individual stocks, you truly are setting the price for what you want to pay – and you can get paid handsomely to do it. Take Wal-Mart (NYSE: WMT), for example. It’s currently trading near $95.50 per share. Here’s the current daily chart. On August 16, it announced stellar earnings, hence the huge $10 jump it had that day, but it has since pulled back a bit to its current level. So, let’s say you’re in the market to buy 100 shares of WMT, but not at the current price. No, you want to name your own price and buy it for $77.50 per share. Because, based on the charts, that’s the low point that’s held support over the past 12 months, and, should it reach that price, you think it could bounce back strongly from there. But to even have a chance to buy WMT at $77.50, the stock itself would have to drop another $18 per share. Since there’s no guarantee that could happen, how does selling put options help? Well, for starters, you’re being paid the upfront premium (instant money in your pocket) just for letting the market know that you’re willing to buy WMT for $77.50 per share. Secondly, if WMT doesn’t fall to $77.50 in the allotted time frame (by the option’s expiration date), then you can name your price again and collect another round of upfront income. Imagine doing this a few times a year – before you know it, you’ve collected a tidy sum of instant income. 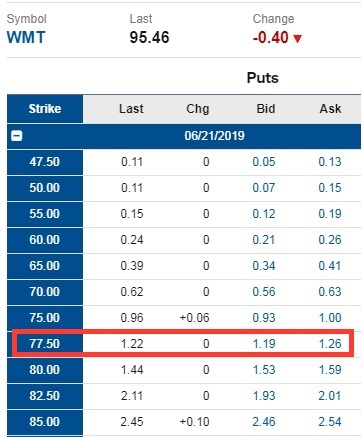 Well, using the chart above, the WMT June 2019 (10-month) $77.50 put option is currently paying out $122 (splitting the bid and the ask prices) for every contract sold. This means you’d receive $122 in your pocket for every 100 shares of WMT you agree to buy at $77.50 per. If your trade size is 500 shares, say, you’ll be paid $610 (5 contracts x $122) for your agreement to buy 500 shares at $77.50 per. If WMT fails to drop to $77.50 by next June, you can repeat the trade and collect another $610 (or whatever the prevailing rate is), and so on and so forth. If WMT does fall to $77.50 at the end of the expiration period, then you get to fulfill your wish and buy the stock at your price. There are thousands of stocks you can sell put options on. You could conceivably collect thousands of dollars every month using a put-selling strategy on your favorite stocks at prices you choose. Unlike with car insurance (or really any kind of insurance), you’re in complete control with this strategy. Just plug in the stock, the price level, and the expiration date, and voila, here’s your cash reward. That’s truly a great “name your price” strategy, and it takes no time at all. Imagine setting aside a few minutes here and there, over a week, a month, or even a year, and you could be matching a year’s worth of salary.